Before your company spends significant chunks of the budget for a system that isn’t a true solution, KMH can help you choose the best racking system for your company. Cantilever is defined as “a beam anchored at one end only”. The load is held by the arm which transfers the load to the supporting upright beam/base. Cantilever racking is primarily used for storage of bulky, over-sized, long loads such as timber, plasterboard, steel trusses & piping, PVC carpet. Drive In Pallet Racking is installed in warehouses and distribution centers that need a cost effective, high density storage solution for their pallets and products. Because of its design, drive-in pallet rack is a first in, last out (FILO) storage system. Drive in racking is best used with a large quantity of like-products that are not time sensitive, to best utilize warehouse space. Warehouse access aisles are kept to a minimum with drive-in rack, often allowing users to achieve double or more storage capacity. 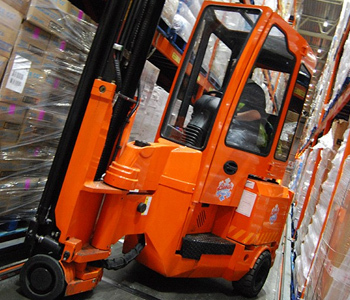 Push back racks allow for fork lifts to deposit loads more quickly. The newest loads push the previous items back up the incline to instantly create the space needed to keep items safely on the rack without the need to remove items or reorganize your racks to make room. It also cuts down on travel time for the forklift operator, meaning your operations will flow more efficiently and place less stress on your workers and equipment. 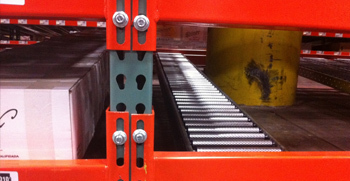 Pallet flow rack systems act as a sort of pallet conveyor for your warehouse. Pallets are loaded from one side and picked from the other, while the rest of the work is done by heavy-duty rollers. This has the potential to save both time and labor. Pallet flow rack systems also save time by offering immediate access to every product stored on the system, meaning you won’t have to pull any pallets simply to gain access to other pallets. Contact us for a FREE Operational Audit to make the best choice and investment for your company! How much floor space is available in your facility for pallet storage? How high are your ceilings? What type of pallets do you use and what are the sizes? How many different SKUs will be stored in the racks? How often do you need to access the pallets? What type of fork truck will you use to access the racks? What is the lift height of these fork trucks? Now that you better understand your requirements, let’s take a quick look at the common types of pallet storage and the advantages/disadvantages of each. Drive-in racking is a type of storage system that allows fork trucks to drive directly into a bay. Pallets rest on side rails rather than cross beams, which leaves the face of the bay open. The uprights are typically tied together at the top of the upright to add rigidity to the system. The only difference between drive-in and drive-through racks is whether there is an entrance at only one end (drive-in) or both ends (drive-through). Using a forklift, pallets are pushed back on inclined rails mounted inside the racking structure. As a pallet is withdrawn, the pallet behind automatically slides to the front position. Gravity racking allows for easy sorting and distribution of commonly used SKUs, and is excellent for large volume SKU movement. Gravity flow rack also helps employees avoid injuries by keeping them further away from the forklifts that are operating on the input side of the aisle. Cantilever is ideal where ‘open face’ entry is needed. A free standing storage system with load bearing arms extending from vertical columns. This design allows for instant access to one piece or a full load and can be adapted for light to heavy loads. The most obvious advantage of double deep pallet rack is its potential to increase storage density and maximize warehouse space. 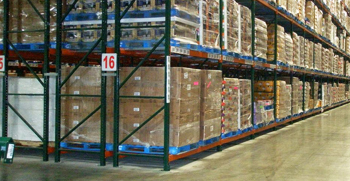 The ability of double deep pallet rack to eliminate unneeded aisles means more warehouse space can be used for storage. 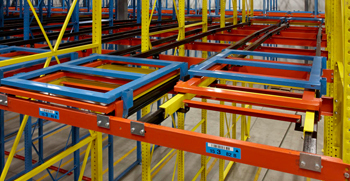 One of the most valuable benefits of pallet racking systems is its space-saving nature. The benefit of being able to easily access your pallets will help increase productivity and decrease frustration. 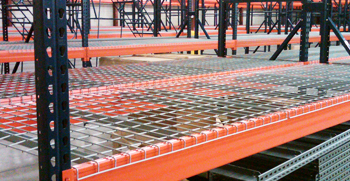 Pallet racking provides easy access to inventory which will help your workers work better. From pallet racks to drive-in racks, whatever your warehouse or distribution center needs in industrial racks, we can help you find the best solution at the best prices! Call us today 888-564-7978 or please use the form below to set up a free Operation Audit so we can start helping you maximize your efficiency. Every warehouse has different needs and fulfillment processes based on their product and end customer. Depending on your type of inventory and order flow, there are multiple racking options to fit your specific needs. Is your warehouse fraught with non-standard products that are over-length, bulky, and creating chaos on your storage floor? You can maximize your available space with a simple rack system. Whether you need upright frames for vertical storage or load beams to store heavy cargo, machinery and other weighted objects KMH has you covered. Your warehouse operation is only as profitable as your ability to fulfill orders efficiently. We have what you need, and will present you with all your available options to increase your ROI. We can help you choose the perfect rack for your forklift fleet and employee productivity needs. You aisle width is extremely important when considering how to access your products via forklift. We help you design the perfect ways to add extensions to existing uprights or buy taller uprights to make maximum use of available clear height. Extensions can be bolted onto existing frames to provide as much height as is necessary. 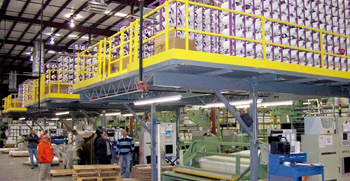 Mezzanines can provide space for dense shelving necessary for slow movers. Attention to pallet dimensions can allow some facilities to position beam levels so that no more than 4-6” is wasted for pallet lift-off. Often an entire additional beam level of storage can be created by reducing wasted beam spacing. Dramatic increases in pallets stored per cubic foot can be achieved by converting to Narrow Aisle stand-up trucks. You can even go as efficient as Very Narrow Aisle equipment that uses roughly 60” aisles. We help you space out your operation so it is lean and clean. Carton, or case flow rack, pick modules and horizontal carousels also offer high density piece picking alternatives. Stack-racks may help reduce the footprint of bulky items. Deep reach, push-back, drive-in and pallet flow systems all increase storage density. Slow movers, seasonal products, multiple pallets per SKU items, etc. all are great places to start looking for storage alternatives. Other high density options include Mobile Aisle systems, Automated Storage and Retrieval Systems (ASRS), Mini-Load systems. Vertical storage options include Vertical Lifts, also called Shuttles, and Vertical Carousels. Even in a small warehouse slotting to reduce wasted travel time can have a big impact in storage and retrieval time. Remember that often the most expensive part of picking an order is the labor to pick it. Keeping your ROI at maximum can be accomplished with ease and our 40 years of experience. Call us today 888-564-7978 or please use the form below to set up a free Operation Audit so we can start helping you maximize your efficiency. A racking system and warehouse flow plan will help you reduce undue costs and still maintain performance levels when implemented well. KMH can perform a complete Operational Audit to analyze your current workflow and give you meaningful recommendations for a measurable ROI. 1. How much you want to spend for a racking solution. 2. The amount of floor space available in your facility. 3. The height of your ceilings. 4. FIFO (first in, first out) or LIFO (last in, first out) for your product. 5. The shelf life of your products. 6. How many pallets you need to store. 7. What type and height of lift truck you use. 8. The type of access you need to your products. 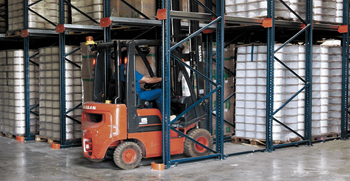 Drive-in rack and Drive-through rack allow the forklift to drive into the stacked rows. A Drive-In configuration has an entry point only at one end, a Drive-Through rack system has entry points at both ends. The base, the arms, and the horizontal and/or cross bracing. Horizontal and/or cross bracing are used to connect two or more columns together. Cantilever can be portable that can be unfolded to allow convenient access to items at the same time. 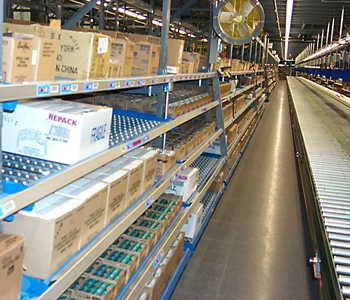 A Pallet Flow Rack System uses a slightly inclined rail with rollers that allow pallets to move easily along the sloped plane. These systems are also called gravity flow or dynamic flow systems. Shelving/storage units fitted with wheeled traction systems. Units can be closely packed when access is not required, but can be readily moved to open up an aisle to allow access. By eliminating the need for a permanently open aisle between every unit, Each shelving unit is normally mounted on a level track-way (to eliminate gradients in the supporting floor), making it possible to move heavy units with minimal effort. 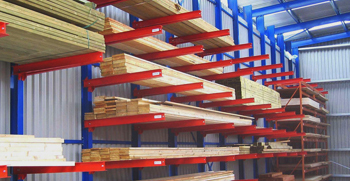 This is the most common pallet racking system. There is a roll formed, which rest on the horizontal load beams and are held in place by mounting clips, and a structural style where the beams are attached with bolts and have greater weight-bearing capacity.